This page was set up by Robert Sewell in July 2006 to show the descent of the Dukes of Normandy through to Robert the Bruce, King of Scotland. Robert Sewell graduated from McMaster University (Hamilton, Ontario, Canada) in 1967 with a B.Sc. degree in chemistry. After a year of studies at the University of Toronto's College of Education, he taught high school science in Collingwood, Ontario for a year and then taught chemistry, physics and general science in Hamilton, Ontario for twenty-nine years. Robert Sewell retired from teaching in June 1998. David C. Douglas: William the Conqueror, University of California, 1964. G. A. Moriarty: The Companions of the Conqueror, The American Genealogist, Oct. 1944. George Andrews Moriarty: The Plantagenet Ancestry of King Edward III and Queen Philippa, Mormon Pioneer Genealogical Society, Salt Lake City, Utah, 1985, pages 10 and 11. Some folks prefer to begin their genealogy with even earlier persons as mentioned in the ancient sagas of Norway and Iceland. For more, please click on Norse Sagas. Generations One to Four below also appear in Florence Van Rensselaer, The Livingston Family in America and Its Scottish Origins, New York, 1949, pages 55 & 56. To view this line, click HERE . Why are some names different on other pages? "In the early middle ages and earlier we frequently find the same person with two or perhaps more different surnames. The given name may be followed by a patronymic (for example, 'Fitz John'), sometimes by a descriptive (for example, 'the Red' - perhaps in Latin or Norman French) and sometimes by a place name (for example, 'de Cave'). Any of these can, over the years, develop into a fixed surname, but in the earlier years the same person may in different records appear with two or more of these 'surnames' of these types, and if he holds land in two or more places, perhaps with more than one place name. And any of these can be correct. Given names may be in French or the English of the period depending on the record where it appears (for example, Piers or Peter), and either can be correct. No attempt is here made, nor should it be, to bring these names into uniformity since the name used should follow the evidences cited." Eystein married to Ascrida Ragnvaldsdottir. For Acrida's descent , please click Norse Sagas. Swanhilda Eysteinsdottir who married King Harald I Haarfayer (circa 848/852 - 936) Harald was King of Norway in 883 and he was deposed or abdicated in 932. Hallad Ragnvaldsson who became Earl of Orkney circa 983. Frederick L. Weis and Walter L. Sheppard: Ancestral Roots, 7th Edition, Baltimore, 1999, Line 121E 18. It has been suggested that Rolf Ragnvaldsson (a.k.a. Rolf the Ganger) and Rollo of Norway (1st Duke of Normandy) are two people, Rollo being a son of Rolf. This would be especially tenable if Rolf was born as early as 846 AD; in which case he would have been an unrealistic 65+ years old or so when he laid seige to Paris and then went on to live to the almost unbelievable age of 86 when he died in 932. 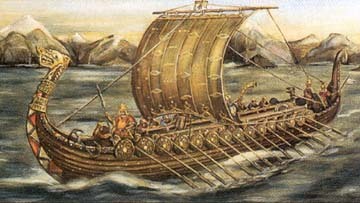 Encyclopeadia Britannica states that Rolf was a "Scandinavian rover who founded the duchy of Normandy. Making himself independent of King Harald I of Norway, Rolf sailed off to raid Scotland, England, Flanders, and France on pirating expeditions and, about 911, established himself in an area along the Seine River. Charles III the Simple of France held off his siege of Paris, battled him near Chartres, and negotiated the treaty of Saint-Clair-sur-Epte, giving him the part of Neustria that came to be called Normandy; Rolf in return agreed to end his brigandage. He gave his son, William (I) Longsword, governance of the dukedom (927) before his death. Rolf was baptized as 'Robert' in 912 but is said to have died a pagan."
. . . courtesy of The Encyclopeadia Britannica Web Site prior to their reverting to a pay service. 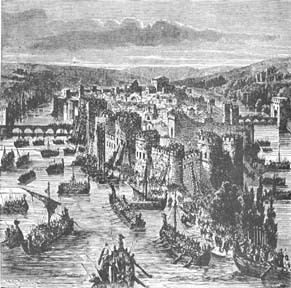 Laying siege to Paris appears to have been a popular pastime in the late 9th and early 10th century. 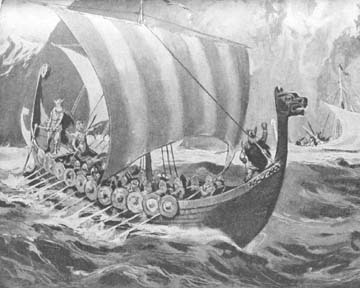 Asser wrote in his Life of King Alfred: "In the year of our Lord's incarnation, 886, which was the thirty- eighth since the birth of Alfred, the (Viking) army . . . directing their ships to the river called the Seine, and sailed up it as far as the city of Paris, and there they wintered and measured out their camp. They besieged that city a whole year, as far as the bridge, that they might prevent the inhabitants from making use of it; for the city is situated on a small island in the middle of the river; but by the merciful favour of God, and the brave defence of citizens, the army could not force their way inside the walls." The small island in the middle of the Seine was originally the entire city. Rolf married first in 886 to Poppa, whose ancestry is uncertain. 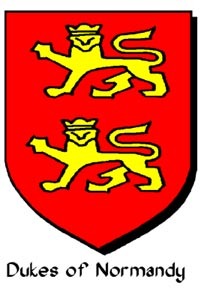 Poppa may have been a daughter of Count Berenger of Bayeux, or she may have been a granddaughter of Seigneur Pépin (II), Count of Peronne who was a great grandson of Charlemagne. Please click on The Ancestry of Poppa for details. For her possible descent from Seigneur Pépin, please click on Count of Peronne. Rolf is said to have had other wives and many more children. This beautiful site offers a full translation and commentary on the Planctus or Mourning Poem for William Longsword. As well, visitors are invited to ". . . to download all the files on this site for use on your home computer." This feature enables you to download the entire site and work through it at your leisure. William Longsword was involved in a war in the late 930's against Arnolph I "the Great", Count of Flanders. Some sources state that a peace conference was held in December 942, and that Arnolph arranged for the murder of William Longsword at that time. Other sources state that "Arnolph waged war against William of Normandy, whom he defeated and slew". William married first to Sprota (Adela) of Senlis, a daughter of Hubert (I), Count of Senlis and Vermandois who was a great great grandson of Charlemagne. Click on Count of Senlis for this descent. William married second in 935 to Luitgarda of Vermandois, a niece of his first wife Sprota. Richard married first in 960 to Emma of Paris (died 962), a daughter of Hugh "the Great" Capet. Richard married second to Gunnor of Crêpon. It is quite probable that Richard and Gunnor had some of their children prior to Richard's marriage to Emma of Paris (960 - 962). Richard and Gunnor married after Emma's death, thereby legitimizing all the children. A relative of Gunnor named Osbern was a powerful Steward or Dapifer of Normandy during the minority of William the Conqueror. Osbern was murdered in 1040 during an attempt on the life of the young Duke William that occurred right in William's bedroom. Osbern was almost certainly Gunnor's nephew, a son of her brother Herfast; although some sources claim Osbern was Gunnor's brother. Ralph of Gacé who is said to have arranged the murder in 1040 of his cousin Gilbert "Crispin", Count of Brionne, who was chief tutor of Duke William at the time. St. Edward the Confessor, King of England 1042 - 1066. See Wessex and England. Alan (III), Count of Brittany who was a guardian of the young Duke William and is said to have "died suddenly", probably murdered, in October 1040. Gilbert "Crispin", Count of Brionne, chief tutor of Duke William for a brief period in 1040. He is said to have been murdered on the orders of his cousin Ralph of Gacé. Nicholas who following his father's death was relegated to a monastery (first to Fécamp and then Saint Ouen in Rouen) and Robert "the Devil" took over as 5th Duke of Normandy. In later life, Nicholas was a loyal supporter of his cousin William the Conqueror. About 1042, Nicholas became Abbot of the monastery of Saint Ouen. Guy, Count of Burgundy who attempted to seize control of Normandy in 1047. Matilda (or Maud) who married Eudes (I), Duke of Burgundy. Eleanora (Judith) of Normandy who married Baldwin IV, Count of Flanders as his second wife. Papia, said to have married "Turchetil" who may have some connection to Turchetil who was a guardian of the young William the Conqueror. Died between July 1 and 3, 1035 at Nicaea in Bithynia while returning from a pilgrimage to the Holy Land. Ancient Nicaea was located about 65 miles south east of Constantinople. Referred to as Robert "the Devil" (Moriarty, Planatagent Ancestry, pg. 13), he is also known as Robert "the Magnificent". Robert had a girlfriend named Herleva. Both were under twenty, possibly as young as seventeen, when Herleva became pregnant with their first child who was to become William the Conqueror. Herleva's father was Fulbert, who was probably a tanner. Fulbert has been described as "polinctor" which translates more readily as "embalmer", or one who prepares corpses for burial, but the traditon is strong that he was a tanner; and Falaise, Normandy was famous for its tanneries. Apparently there were no hard feelings with regard to Robert and Herleva having a child without undergoing the formality of a church ceremony. Fulbert was given a subordinate office at the ducal court, and Herleve's brothers, Osbert and Walter, appear as witnesses to various charters. As well, while Walter was never an official tutor or guardian of the young Duke William, he watched over William during his perilous childhood; and on occasion saved his life by snatching the boy from his cot and carrying him for safety to spend the rest of the night in the cottage of a poor family. It would appear that Robert and Herleva "broke up", but once again, there do not seem to have been any hard feelings. Herleva married to Herluin, Vicomte of Contreville, and they had two sons: Odo, Bishop of Bayeux and Earl of Kent; and Robert, Count of Mortain; both of whom were very close to their half brother, William the Conqueror; and both of whom were present at the Battle of Hastings. In late 1034, curiosity or devotion induced Robert (I) "the Devil", 6th Duke of Normandy, to undertake a pilgrimage to the Holy Land, where the fatigues of the journey and the heat of the climate so impaired his consitution he died at Nicaea (in the area of Iznik in modern Turkey) on his way home. Matilda (Maud) of Huntington, born circa 1072 - 1074 who married first in 1090 to Simon de Saint Liz, Earl of Huntingdon and Northampton (died in 1111) second in 1113 to King David (I) the Saint of Scotland. Robert married in 1031 to Estrith, daughter of Sweyn Forkbeard, King of Denmark. They had a divorce in 1032. Estrith had been previously married to Robert's father, Richard "the Good" and they had a divorce after a year or so as well. We are left to wonder if Estrith, whose mother was known as "Sigrid the Haughty", was difficult to get along with. Born in 1028, probably in the autumn, at Falaise, Normandy, France. Duke of Normandy 1035-1087 and King of England 1066-1087. Died early in the morning on Thursday, September 9, 1087 at Hermentrube, Near Rouen, France. Interred at the Monastery of St. Stephen, Caen, Normandy which he had founded. William invaded England, defeated and killed his rival Harold at the Battle of Hastings, and became King. William was noted for his efficient if harsh rule. Please click on William the Conqueror for more information and links. William married in 1053 at the Cathedral of Notre Dame d'Eu, Normandy to Matilda of Flanders. Please click on Mathilda of Flanders for her descent from the Kings of France and Charlemagne. Stephen, King of England 1135 - 1154 who married Matilda, a granddaughter of Malcolm III Cænmore, King of Scotland. Henry reigned as King of England from 1100 until his death in 1135. In 1106 he captured his brother Robert and took over as Duke of Normandy from 1106 to 1135. Henry was nicknamed "Beauclerc" (fine scholar) for his above average education. During his reign, the differences between English and Norman society began to slowly evaporate. His reign is notable for important legal and administrative reforms, and he proved to be a hard but just ruler. He is reputed to have died from over consumption of lampreys, but there is a good possibility that the excess of lampreys only gave him a bad case of indigestion and that a carelessly dispensed dose of purgative was in fact the cause of his demise. Robert de Caen, Earl of Gloucester, born circa 1090. 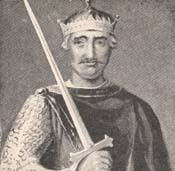 Robert was the eldest of a vast number of natural (illegitimate) children of King Henry I. Click on The Children of King Henry for details. Henry married first on November 11, 1100 to Matilda (Edith) of Scotland, a sister of King David "the Saint" of Scotland. Please click on Matilda for her descent from the ancient Kings of Scotland. Euphamia, born July 1101, died young. King Richard (I) "the Lion-Hearted"
King John who, under considerable pressure, granted the Magna Charta and then attempted to welsh on the deal. Click on King John for details. William the Aetheling, born before August 5, 1103 and drowned in the sinking of the White Ship on November 25, 1120. When the white ship was wrecked on the deadly rock a boat was launched and William, the King's only legitimate son, was rowed to safety. The cries of his half-sister Maud, Countess of Perche, induced him to return to the wreck where they sank together. This was considered by some to be punishment for Henry's sins of lust in having so many illegitimate offspring.William was married to Isabella (Matilda), but they didn't have any children. After her husband drowned she became a Nun, and was elected abbess of Fontevrault. Henry married second on January 29, 1122, to Adeliza of Louvain. They don't appear to have had children. Robert de Caen, called "the Consul", married to Mabel (Maud) Fitz Hamon, daughter and heiress of Robert Fitz Hamon, Lord of Glamorgan and his wife Sibyl who was a daughter of Roger de Montgomery, 1st Earl of Shrewsbury. Roger de Montgomery is shown on the Battle Abbey Roll and the Dives-sur-Mer List as having accompanied William the Conqueror in 1066. While it cannot be proven, Roger de Montgomery may have been present at the Battle of Hastings on October 14, 1066. William married circa 1150 to Hawise de Beaumont, daughter of Robert de Beaumont, 2nd Earl of Leicester and his wife Amice de Montfort. Isabel of Gloucester who married in 1189 and divorced in 1199 to King John of England. Amicia married circa 1180 to Richard de Clare, Earl of Hertford and Clare who was one of the 25 Sureties of the Magna Charta. Please click on Richard de Clare for his descent. Gilbert de Clare was one of the 25 Sureties of the Magna Charta. Click on Gilbert de Clare. Gilbert married on October 9, 1217 at Tewkesbury Abbey, Gloucester to Lady Isabella Marshal, daughter of William Marshal, Earl of Pembroke and Isabel de Clare. Please click on Marshal for the descent of Lady Isabella Marshal. Sir William de Clare born on May 18, 1228 and poisoned while eating breakfast in 1258. For the continuation of this line, click on Robert Bruce, Earl of Carrick.